The free speech rally ended early today at Boston Common. 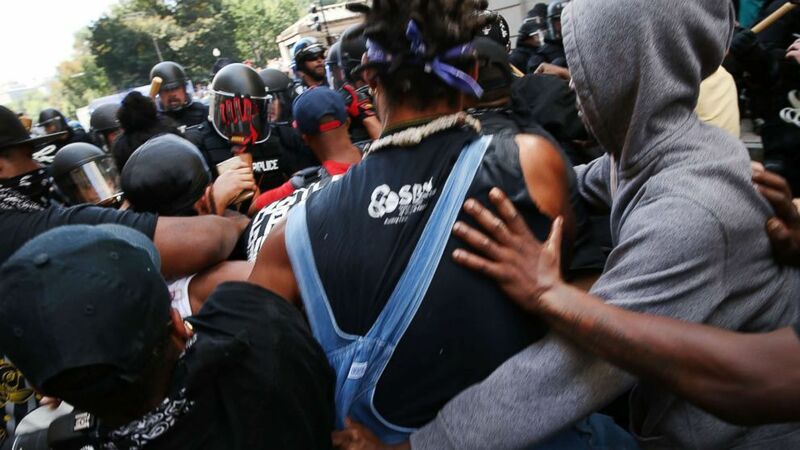 One week after violent protests rattled Charlottesville, Virginia, a scheduled free speech rally in Boston Saturday was met with thousands of counterprotesters, but the day went off mostly smoothly, police said, with 33 arrests but few injuries. The free speech rally was deemed "officially over" by police ahead of its official end time, but thousands of counterprotesters continued to spread out in the city throughout the afternoon, with some protesting peacefully but others confronting officers and people. (Spencer Platt/Getty Images) Protesters face off with riot police escorting conservative activists following a march in Boston against a planned "Free Speech Rally," Aug. 19, 2017, in Boston. A total of 33 arrests were made Saturday, mostly from disorderly conduct and a few assaults on police officers, the Boston Police Department announced. Police Commissioner William Evans said at a news conference this afternoon that some urine-filled bottles were thrown at officers, and police indicated on Twitter that some demonstrators were throwing rocks at police. (Michael Dwyer/AP) Counterprotesters hold signs and chant at the Statehouse before a planned "Free Speech" rally by conservative organizers begin on the adjacent Boston Common, Aug. 19, 2017, in Boston. (Spencer Platt/Getty Images) Thousands of protesters prepare to march in Boston against a planned "Free Speech Rally," Aug. 19, 2017, in Boston. 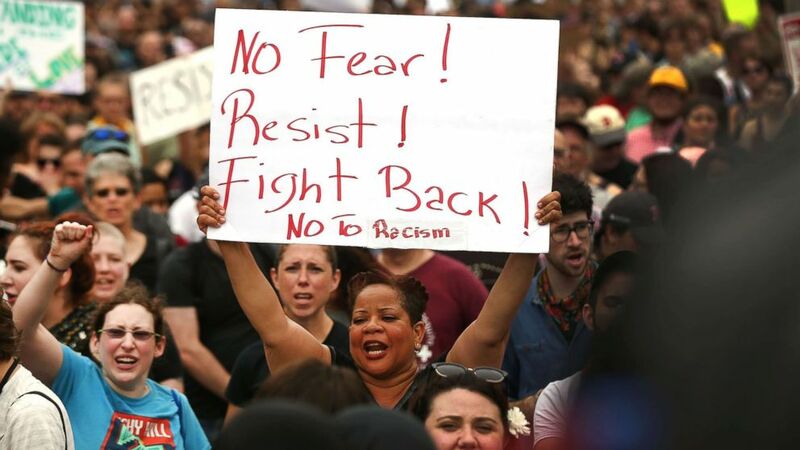 Saturday's massive gathering of demonstrators across Boston was sparked by a free speech rally set to take place from noon to 2 p.m. at Boston Common. 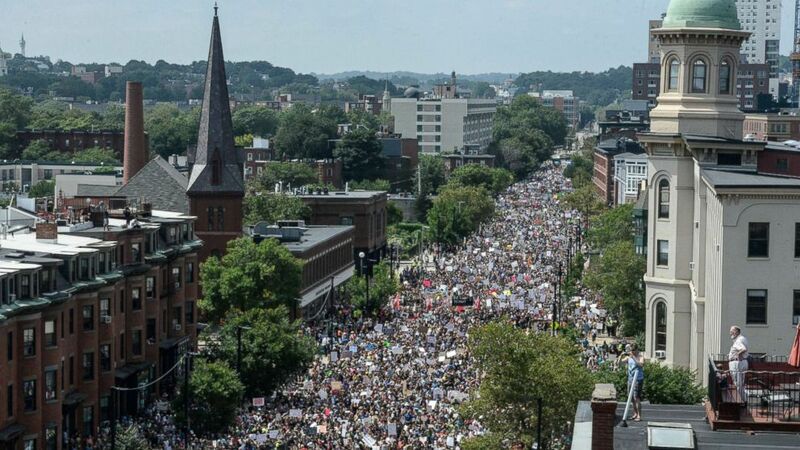 But the rally was deemed "officially over" in a tweet from Boston police at 1:30 p.m ET, and police said the demonstrators had left the Common. Libertarian congressional candidate Samson Racioppi, who was set to speak at the free speech event, told ABC affiliate WCVB, "I really think it was supposed to be a good event by the organizers, but it kind of fell apart." (Michael Dwyer/AP) Organizers depart a "Free Speech" rally staged by conservative activists on Boston Common, Aug. 19, 2017, in Boston. After the free speech event has concluded, counterprotesters still swarmed Boston this afternoon, and riot police also responded in the city. The giant crowds of counterprotesters first gathered in the city this morning holding signs with phrases like, "hate speech is not free speech" and "white silence is violence." (Stephanie Keith/Reuters) A large crowd of people gather ahead of the Boston Free Speech Rally in Boston, Aug. 19, 2017. (Stephanie Keith/Reuters) A large crowd of people march towards the Boston Commons to protest the "Free Speech Rally" in Boston, Aug. 19, 2017. Counterprotesters chanted "no fascists, no KKK, no racist USA." One Massachusetts woman who drove three hours to Boston to attend today's counterprotest told ABC News she has felt "months of depression" and "absolute outrage." "And after Saturday [at Charlottesville]," she said, "I just cannot be silent anymore." Of the free speech rally attendees, she said, "I was glad to see that their crowd was very small. That spoke volumes to me. 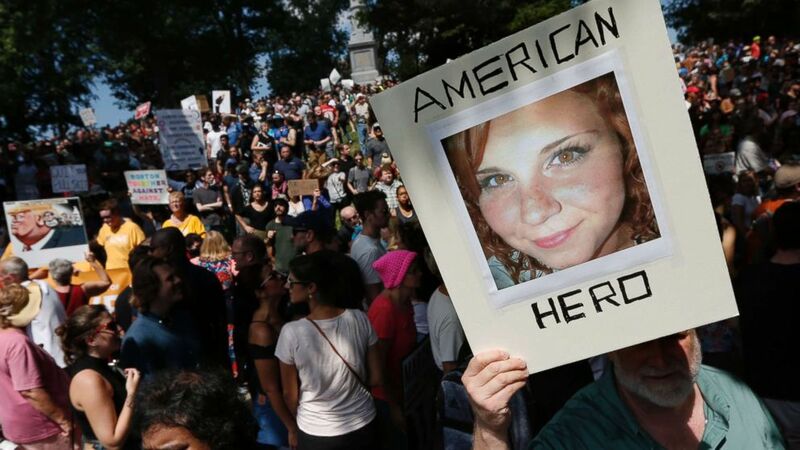 "We have a really long way to go and we have to end white supremacy in all of its forms," she added. Another counterprotester told ABC News, "I just wanted to come out and confront them head on, and I didn't want to miss this chance." "I didn't think that we would ever have to have this confrontation in 2017," she said, "so it feels really vital to just come out and try to stamp it out today. And I'm encouraged by how many other people came out." While many counterprotesters marched peacefully, some scuffled with armed officers. (Spencer Platt/Getty Images) Protesters face off with riot police escorting conservative activists following a march in Boston against a planned "Free Speech Rally," Aug. 19, 2017 in Boston. Video showed several officers taking an individual to the ground after he angrily confronted the officers. 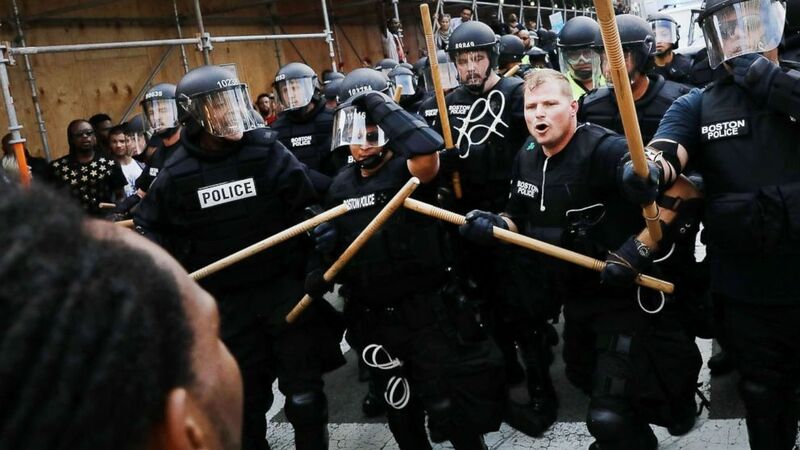 Amid the confrontations, Boston police tweeted that individuals are asked to "refrain from throwing urine, bottles and other harmful projectiles at our officers." President Trump on Saturday afternoon thanked the police in a tweet, saying they look "tough and smart" against what he said appeared to be "anti-police agitators." Trump also tweeted, "I want to applaud the many protestors in Boston who are speaking out against bigotry and hate. Our country will soon come together as one!" Boston Mayor Marty Wash responded to that message by saying that his city stood together for "peace and love." First daughter Ivanka Trump on Saturday night tweeted, "It was beautiful to see thousands of people across the U.S.A come together today to peacefully denounce bigotry, racism & anti-Semitism ... We must continue to come together, united as Americans!" 2:2 We must continue to come together, united as Americans! ???? Throughout the day, protesters also scuffled with each other. 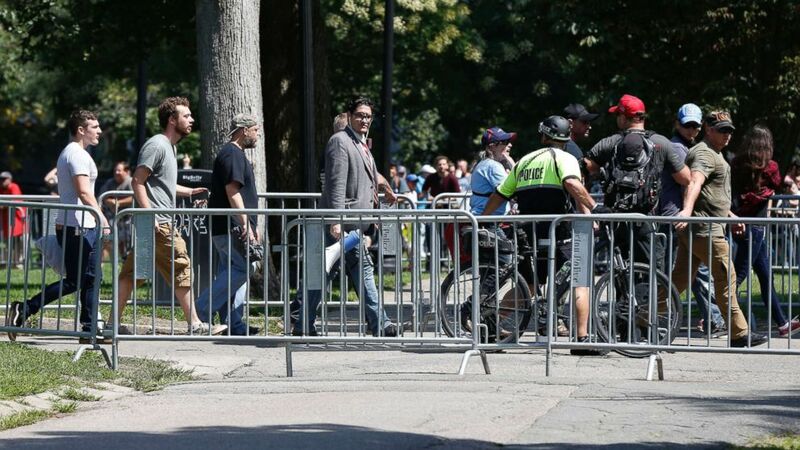 In one tense scene between a man and a counterprotester at the Common, the counterprotester followed the man, saying, "We only hate hate." The man shouted, "Get away from me. Stay right there! You're not even a me [sic], you're not even a woman, you're an it!" As the man walked away, he kicked and punched into the air, leading one counterprotester to yell "Get your bigotry out of here, a------." The man shoved another counterprotester, which caused more people to step in to make sure the situation didn't escalate. Boston city officials said they planned to deploy hundreds of police officers today to prevent violence similar to what took place in Charlottesville last weekend, where a rally by white nationalists, including neo-Nazis, skinheads and Ku Klux Klan members demonstrating over plans to remove a Robert E. Lee statue, ended in the death of a counterprotester after a car was rammed into a crowd that was marching through the streets. (Michael Dwyer/AP) A counterprotester holds a photo of Heather Heyer on Boston Common at a "Free Speech" rally organized by conservative activists, Aug. 19, 2017, in Boston. Heyer was killed last Saturday when a car, allegedly driven by James Alex Fields Jr., that plowed into a group of people during protests in Charlottesville, Va.
"We're going to respect their right to free speech,” Walsh said Friday, but "they don't have the right to create unsafe conditions." Scheduled to speak at the free speech rally, which was organized by the Boston Free Speech Coalition, were Kyle Chapman, who caused controversy online after photos emerged of him hitting anti-Trump protesters, Joe Biggs, who previously worked at the website InfoWars, run by conservative radio host Alex Jones, Republican congressional candidate Shiva Ayyadurai and Racioppi. Walsh said that some of those invited to speak "spew hate," The Associated Press reported. John Medlar, who said he is an organizer for Boston Free Speech, said the group has no affiliation with the white supremacists who marched in Charlottesville, Boston.com reported. "While we maintain that every individual is entitled to their freedom of speech, and defend that basic human right, we will not be offering our platform to racism or bigotry. We denounce the politics of supremacy and violence," the group wrote on its Facebook page. The group is largely made up of students in their mid-teens to mid-20s, Medlar told Boston.com. WCVB reported that the KKK’s national director, Thomas Robb, said as many as five KKK members from Springfield and possibly more from Boston were planning to attend today's rally. 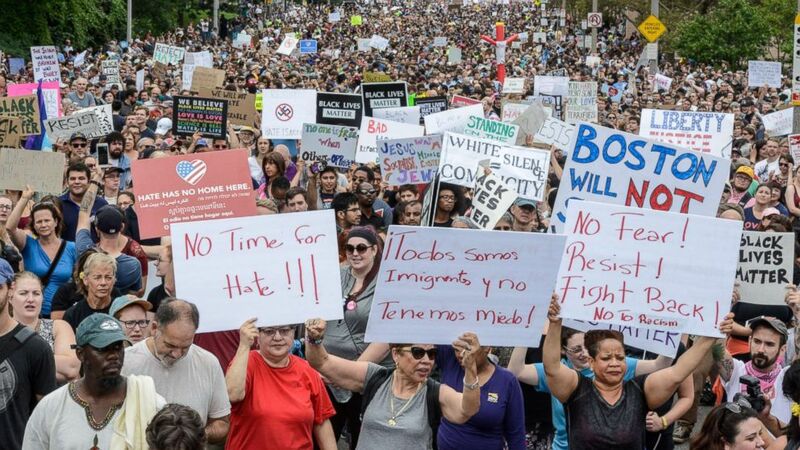 Several other rallies were planned across the U.S. Saturday. Many are in response to the Charlottesville violence last weekend, as well as the movement to remove Confederate statues across the country, and in reaction to Trump’s controversial press conference on Tuesday. 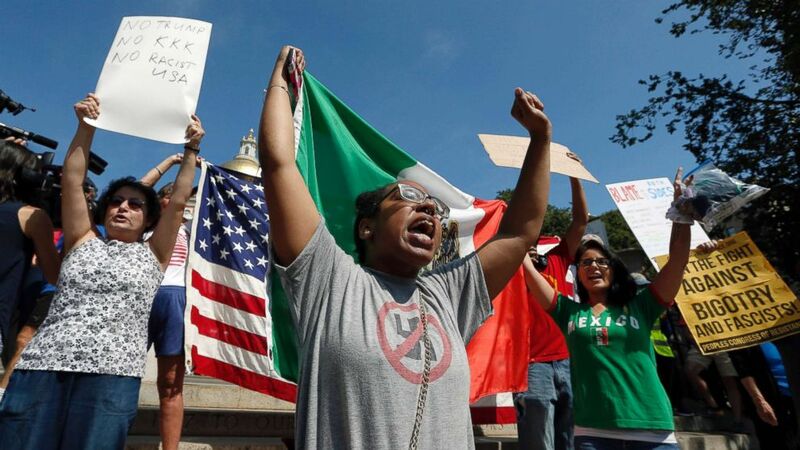 The "Rally Against White Supremacy" took place in Austin, Texas, while the “Black Lives Matter Protests to remove Confederate statues” took place in Houston, and the “United Against HATE: Demand Racist President Trump Resign” rally was held in Grand Rapids, Michigan. Events were also planned in cities including Atlanta, New Orleans and Dallas. ABC News' Erin Keohane and Meghan Keneally contributed to this report.